Silver Lake in American Fork, Utah (and how I finally learned to get out of my comfort zone)! I haven’t always liked the wilderness. It’s true. I won’t deny it. Jerry and I have been together for 12 years and in the beginning of our relationship I went along with small hikes we had available to us when we were living in Kentucky at the time because he enjoyed it and I wanted to spend time with him and his interests. Jerry even went on quite a few 1-2 week long backpacking trips without me over the years and I had absolutely no interest in going with him. It really wasn’t until Connor was born and we moved cross country to Utah that I started hiking more (as a family and at times by myself). And it wasn’t until this past spring that I vowed I would be much more involved because I love seeing him in his natural element and I hate missing out. Plus, Moonshine gives us a huge incentive to be outdoors, too. Me on that same trip – my first time actually backpacking to camp! Last summer when Connor turned 4, the boys went on a lot of camping trips and I only went on a couple with them. Connor had just self-weaned and my hormones were all out of whack so I kept fighting going, just feeling a general melancholy and wanting to stay home and be by myself. But I was missing out and I was feeling that disconnect too and I didn’t like that one bit. But how was I going to fix what was I was missing out on? Surely, it didn’t need to be as difficult as I was making it out to be. Jerry and I really want to bring friends along backpacking and camping who are interested in partaking in our adventures while learning more about the hobby as well. That’s something we’re working on now as we speak. If you’re local to us and interested in joining us, please reach out and let us know! We did it! 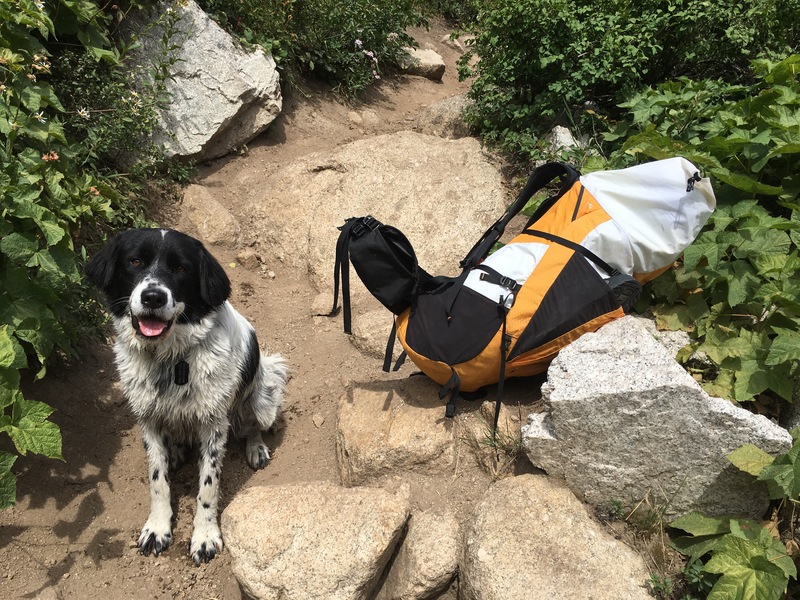 We drove 6 hours each way to Ketchum, Idaho, backpacked 18 miles in 44 hours and I still can’t believe Connor, Moonshine and I survived (Jerry is a very seasoned backpacker – having done the same hike last year in 13 hours, so I knew it would be easy for him)! Anyone who has ever done any hike or backpacking trip knows it’s mostly mental and not all physical. We were excited to be there for our first big backpacking trip together and we were determined to make it happen! We started later in the day at Pettit Lake and the next day headed towards Alice Lake, Twin Lakes, Toxaway Lake and then on our final day hiked 8 miles out. We had packed for and planned to stay another night but the mosquitoes were really bad deep in the forest (and were driving all of us nuts) so we did all we could to enjoy our time there while simultaneously trying to get out! Backpacking with a 5 year old is difficult to say the least but it’s always worth it. He understands the journey isn’t always easy but the end result is worth the work you put into it; and that’s what why we do what we do. He says repeatedly he loves camping and hiking with us when we’re on the trails and that means everything to us. As always, we continue to look forward to our next adventures. We’ve spent one night at home as we finish up this post and we’re already planning to hit up another overnight tomorrow; sitting at home is just no fun! When the weather is nice and dada is off work, it’s time to hit the trails and camp! Resting for a few before we had to retreat to the tent for supper because the mosquitoes were so bad! This tree reminded Connor of the Redwoods he climbed inside of in Yosemite earlier this summer! One of the many streams/rivers we had to help one or both of the boys across! Moonshine was thankful for dada’s help! Before we set up camp next to Toxaway Lake 😍 does it get any better than this?! The view we saw when we were finishing the 18 mile loop 😍 we were so close but still too far! The last few miles were tough (especially the final one)! Thank you for the memories, Sawtooth National forest! We’re getting pretty good at traveling over night so we decided to take off 12 hours south to San Diego for 5 nights (3 in the city and 2 traveling). Moonshine came with us again, so it was essential that we find the dog friendly beaches we could all enjoy. Ocean beach people’s organic market (a wonderful local organic market to grab anything you’re looking for; we grabbed snacks and breakfast items for our Airbnb here). Raglan Public House (great burgers, fries, speciality drinks and an amazing cookie and ice cream skillet). Wahoo’s fish tacos (it was rated very well on google reviews and it was decent; we wouldn’t go back the next time we visit though). Pizza port ocean beach (amazing pizza – the sauce was tangy and sweet) and they had a wonderful cider on tap. The baked bear (custom ice cream sandwiches to die for)! Little Lion Cafe (an adorable breakfast spot with a large assortment of breakfast drinks and speciality meals). There were only two outdoor tables offered but we arrived right when they opened and got lucky to get a seat. We also visited Coronado beach. It was not quite as large or as busy as dog beach. The vibe in Coronado was a little too affluent for our taste but it was a great place to visit nonetheless! The last beach we briefly visited (only one time) was on fiesta island. While it’s dog friendly everywhere (no restrictions to this) there wasn’t a lot of real sand, no shells for Connor to find and the ground was pretty dirty overall. It was ok to visit but it was our least favorite and we wouldn’t return when we go again. For our last night in San Diego, we left our Airbnb and went to downtown to stay one night at the Hotel Z (stay pineapple – a hip and very dog friendly establishment). It was in the Gaslamp Quarter which was a great central location that had a lot of great restaurants that were….you guessed it – dog friendly! Barleymash had a large patio and great salads! Rustic root was an upscale farm to table restaurant that was really good. Connor enjoyed his crab cake (and Mac and cheese with bacon)! We’re suckers for ice cream so Cali Cream was a must try! The cookies and cream with cookie dough was amazing! For our last breakfast in San Diego, we hit up Richard Walker’s pancake house and tried a Bavarian pancake (we had other items, too but who wants to see those over this)?! And last but not least, on our last day, Jerry and Connor did a tour at the USS Midway Museum. It was a similar sized ship Jerry had been deployed on twice when he was in the Marines and Connor wanted to see it. While I finish up this blog post, we’ve had one refreshing night of sleep at home again, are back to our normal cooking and eating at home and the boys are planning to camp tonight and give me a much needed break 😊there’s never any true downtime with Connor around unless he’s sleeping or gone with one of us; so until next time, you’ll find us encouraging Connor’s mission to wake, explore, repeat! We originally planned to only take a family trip for Connor’s 5th birthday and then somehow in addition we ended up deciding to have around 30 people over to celebrate with us the week before his actual birthday. When you have a forever only child and 5 only comes once, well, to hell with trying to be conventional 😂 We’ve only had one other party for him so far and that was on his 3rd birthday. The every other year big celebration is working well for us thus far! We booked Scales and Tails to come to our house and they were a hit with Connor and his friends! This was the second time we’ve booked them and we were even more pleased than last time; they just do a phenomenal job teaching about the reptiles and engaging the kiddos. We also had a handmade piñata, animal themed veggie and fruit platters (in addition to pizza, local spinach/strawberry salad and homemade BBQ chicken) animals on top of multiple cakes with party hats and a large helium dinosaur with a Polaroid camera for a party favor. We all had a lot of fun (even though Connor was a little overwhelmed a couple times and we joked that’s how you know it’s a good party)! 😂 We will definitely throw another party for him in the future. Next time around, we would love to do a hike with a handful of friends (but we realize it is hard to coordinate that with everyone and not all kiddos his age are interested or able). As he gets older, hopefully that will become more possible! In lieu of presents, Connor asked for dog/cat food or toys for donations to the local humane society. He received many things and we delivered them a few days after his party. He was so proud to help! This is definitely something we want to continue doing in the future. We have wanted to camp in the Escalante National Monument area for some time and finally made it happen. It’s about 4 1/2 hours from our house and we left a little later than we hoped we would (such is road tripping life with Connor and Moonshine….and momma – I’m a little slow sometimes but I try to hurry)! When we arrived at the Upper calf creek falls area around 5pm, it was thundering and raining pretty hard so we decided to go find a place to set up our tent and wait it out a bit. That was a really good choice because it gave us something to do and luckily the rain didn’t hang around for long. We set up our tent and then made s’mores at Connor’s request. I think we’ve finally figured out the secret to success for Jerry getting a fire going; if we eat one s’more without the marshmallow heated (thinking he won’t get it going) and then he does, we have one…or two more! I love that he never gives up; he says no one in this family is allowed to give up (we’re all pretty strong willed)! After our snack, we headed back to the hike and got going following the cairns and Moonshine; he is such a great leader for us on trails and we are very lucky he is so obedient off leash! If you had no idea what you were doing on this hike, it may be easy to get lost. The terrain is a mix of rock and sandy trails. The evening hike was a perfect time of day to go – perfect temperatures as one would expect on a hike in the desert in the evening. Moonshine loved the pool at the end (and we loved watching him cool off as always)! At 6am, Connor sat straight up in the tent and was ready to go. If we were home he would have slept a couple more hours but when camping, he’s always up when the sun is up! Jerry packed up the tent while the rest of us warmed up in the car. We made a quick breakfast and drove to Lower Calf Creek Falls . We were so thankful to start at 8am when there were still some chilly shaded spots. By the time we finished up the 5.5 miles nearing 1pm, it was getting pretty hot out (even though it was only in the 70’s)! There were lots of deer and lizards to see on the trail and plenty of breaks in the trail where Moonshine could access the water to cool down. And of course, the Falls were breathtaking and worth the entire trip. 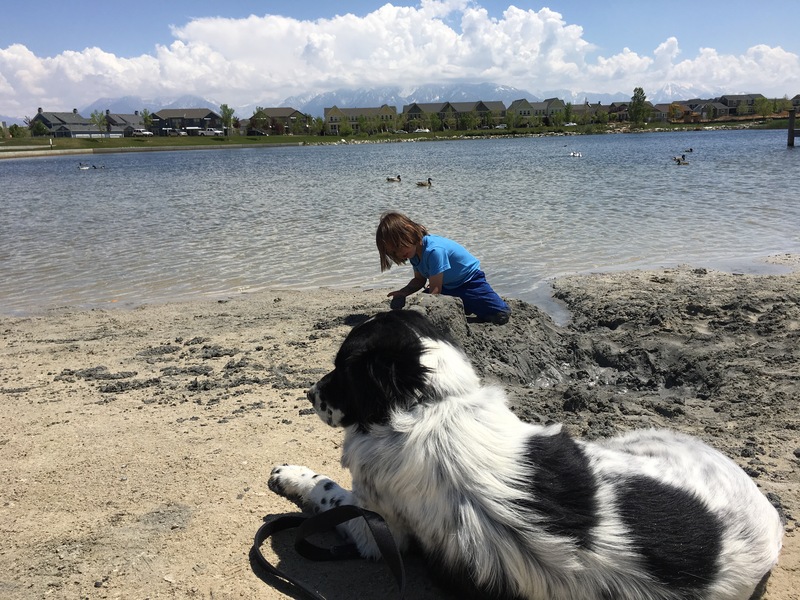 Once again on this trip, we were reminded about the importance of lowering our expectations as traveling, hiking and camping with a 4 year old and dog is totally different than doing all of that alone as adults. We’re pretty realistic at this point but it always helps to remind ourselves to chill, just go with the flow and most importantly, to be proud of ourselves for even trying at all! We didn’t see a kiddo Connor’s age on either of the hikes we did on this trip! To us, there is nothing better for him to have these experiences in nature. He always makes time to enjoy all the little things like climbing a tree, looking for treasures and insects, burning his marshmallows extra crisp, sitting in the sand to rest and looking for fish while Moonshine takes a dip. I never loved adventures quite like I do now seeing his excitement for all these little things (which are big things to him) and that is why we continue to make family outdoor adventures our top priority! Jerry’s mom, Bridget, died suddenly and unexpectedly this past December 14th, the day before her 69th birthday. Like with any loss, there has been a myriad of emotions with each family member. Jerry’s dad has been having the most difficult time which after spending 42 years together, you would except that to be the case. He came to see us recently and it was a really good weekend visit. I immediately saw in him, how grieving is like living two lives; one where you pretend everything is alright and the other where one’s heart silently screams in pain. The best we can do for loved ones in this situation is to give them permission and the space to allow them to experience both sides and to be present with them whenever they need you. While Jerry Sr. was here, we took him on two different hikes which he later said he really enjoyed. Jerry and I strongly believe that time in nature can help everyone in any situation (and while we know it’s not going to magically cure him of the difficulty he’s having), positive self care outlets are crucial to healing while grieving. After our day hikes, in the late afternoon and evenings, I would cook for us all and clean up while Jerry and his dad had many heart to hearts about how they’re feeling and coping now without her here. I grieve because Bridget was always so welcoming, loving and supportive (she always had been from the first time she met me almost 12 years ago). Also, she herself had a strong willed child (Jerry) and I felt like she was the only person who truly understood how Connor was as an infant and little kid because his father was very similar to him. It was comforting to hear her stories about Jerry growing up; I knew I wasn’t alone and that it will pass and he’ll be just as wonderful as his father. I always thanked Bridget for raising Jerry to be the husband and father he is today because of the values she instilled in him at a young age. I am so grateful I was able to tell her that when I had the chances. A couple weeks before she died, we had spoken on the phone and talked about helping them as they got older if they needed it (which always surprised her when we said that). She would say, “Thank you, Heather, you don’t see too many daughter in laws who would do that!” We are just so heartbroken that we won’t get to spend more time with her but we will hold onto the memories we do have. And we will always share stories and photos with Connor so that he can remember her, too. We survived our first family road trip to the Sierra Nevada! Connor always hated the car seat as an infant and young toddler. Jerry and I would always joke that when we could take a true road trip (longer than our usual 4 hours to the desert to camp) we would have “made it” as far as thriving and not just surviving (insert our humor for our once high needs infant, now strong willed little kid). We decided we would drive overnight for 12 hours to the Sierra Nevada and stay near the Sequoia National Forest one night, then drive a couple hours and stay just outside of Yosemite National Park. It was too cold to overnight camp comfortably in either place in early May, so we stayed in a hotel one night and then in a lodge outside of the park for three nights. While this was more expensive than our fairly inexpensive camping trips, it was definitely worth it for the experiences we had together that week on our first official road trip as a full family (Moonshine included of course)! After we saw all the redwoods, the next day we headed to Yosemite National Park. *Even if you’re staying right outside the park in a lodge (we stayed at Tenaya Lodge), it will take a good hour plus to drive in to the most popular hikes. So that’s two plus hours of driving just to get in and out of the hike plus the time you’ll be in the park. A few trails were dog friendly so we brought Moonshine when we could; otherwise he had to stay behind at the lodge. This is something to always be mindful of when traveling with a dog anyways but especially to national parks. The next day we began with our favorite hike in Yosemite, Vernal falls via the mist trail the bridalviel fall trail mist was like a weak spray bottle compared to the mist we got at vernal! And the terrain could be difficult for many but Connor absolutely rocked it! The “steps” were steep rocks and they were soaking wet from the mist. The waterfall was absolutely gorgeous and relaxing at the top was icing on the cake. This was our favorite day in Yosemite. *we originally hoped to do the second waterfall but doing 3-4 miles total to the first and back was plenty with a 4 year old. The next time we visit when Connor is a little older, we hope to do the full 7 miles. On our last day going into Yosemite, we did half of the Upper Yosemite falls . This was the ultimate stairmaster and was very hot and dry. Jerry carried Connor and we powered through! The best thing about taking this trip is other than our lodging being booked and having a rough itinerary of what we wanted to do in the forest and park, we totally played everything else by ear. If we saw food we wanted to eat, we stopped and ate. If we needed to make a pit stop, we found a place and stopped. We really lived in the moment together that week and that was worth its weight in gold! We know we can road trip with Connor and Moonshine now and we are planning more fun upcoming trips! We kicked off our family camping season at the end of April with an overnight camp up Battle Creek Falls Trail in Pleasant Grove, Utah. Jerry found us an awesome hidden spot to set up camp about 2 1/2 miles up. The coolest thing about this trip was an encounter with what we now know was a ruffed grouse. When we first set up camp, I thought there was a bug in my ear! I felt this low sound deep in my ear and I had no idea what it could be! And the the boys started feeling it, too. A little later about 20 yards from our tent, I saw something flutter in the distance on a log when I also heard the sound. Could it be a bird?! We all set forth to investigate. It was so still, at first Jerry didn’t believe me there was actually a bird on a log. Moonshine chased him up into a tree and it took us a few minutes to find him again because he was camouflaged so well. He continued to flap his wings and make this sound throughout the entire night (it didn’t keep us up, we just heard it when we were awake). They have a low vibrating sound that sounds almost like an engine trying to start up hot can’t. You can really feel it, not just “hear” it which was so awesome to experience as a family! We are looking forward to LOTS of adventures this spring, summer and fall. Thanks for always planning everything out, sweets!!! We love you!! When Minnie died we were all very sad but it wasn’t long before we knew we needed to find another furry best friend for our family. Our family didn’t feel complete without a dog in our home or to accompany us on outings and Connor just wasn’t the same kiddo without a dog. Period. We knew we needed to start looking at local rescues asap. And so we did. 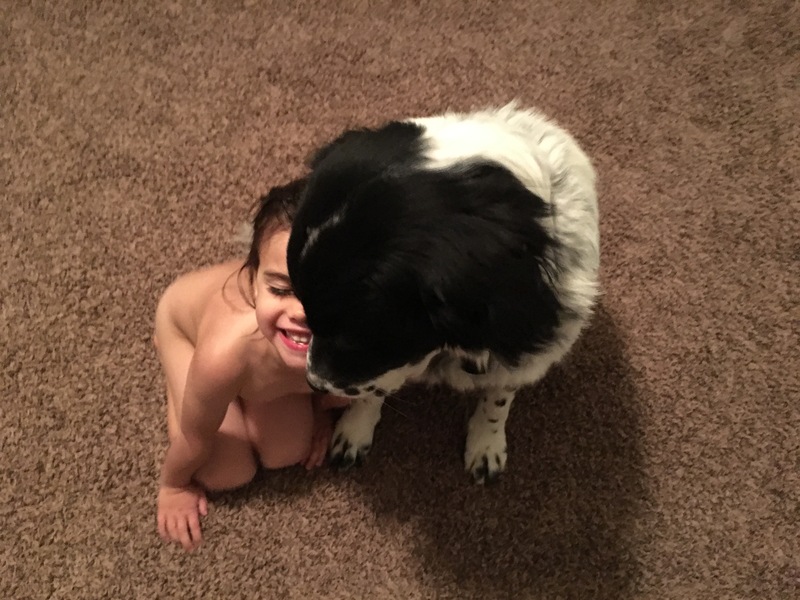 About two weeks after we lost Minnie, Moonshine, a 1 year old male border collie/Great Pyrenees, mix came into our lives from a local rescue group called rescue rovers. And he had quite the rescue story. Apparently Moonshine lived with his brother on a ranch in Oklahoma and when their owner died, they left the ranch together to find food. They ended up at the local vet who had seen them before and knew them, which is how we know this story in the first place. Their owner who died didn’t have any other family around. 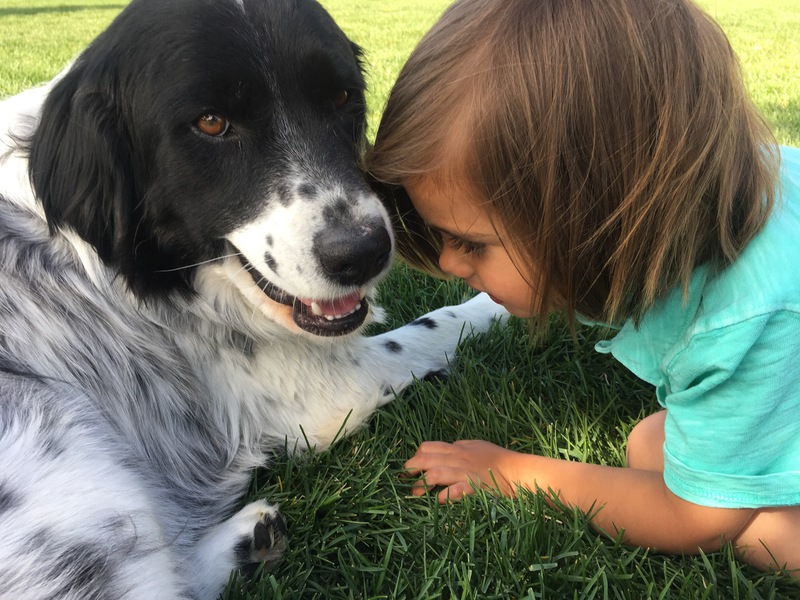 The vet worked with the local rescue there and the pups were transferred to Denver and then onto SLC to a foster family with rescue rovers (his brother was adopted around the same time as him – they were not bonded so they didn’t require them to be rescued as a pair). We told the rescue group we wanted a dog who was friendly and loved everyone and one we could hike and camp with (of course). We were hesitant at first that Moonshine was so large (and hairy) but Jerry went to meet him first before Connor and I did and he said, “he’s definitely the one for us.” A couple days later, we all met him together and as soon as we said hello to him, he flopped down and rolled onto his back so we could pet his belly. That’s when we all knew he was perfect for us. Welcome to the family, Moonshine! The first couple days at home were difficult for me. I missed Minnie a lot and I was nervous about Moonshine transitioning into our home and family. He whined a lot and wanted to be on the front porch all the time and didn’t like the fences back yard at all. Now I knew he was a watch dog and maybe he just needed to see outside, so we stayed outside a lot with him. 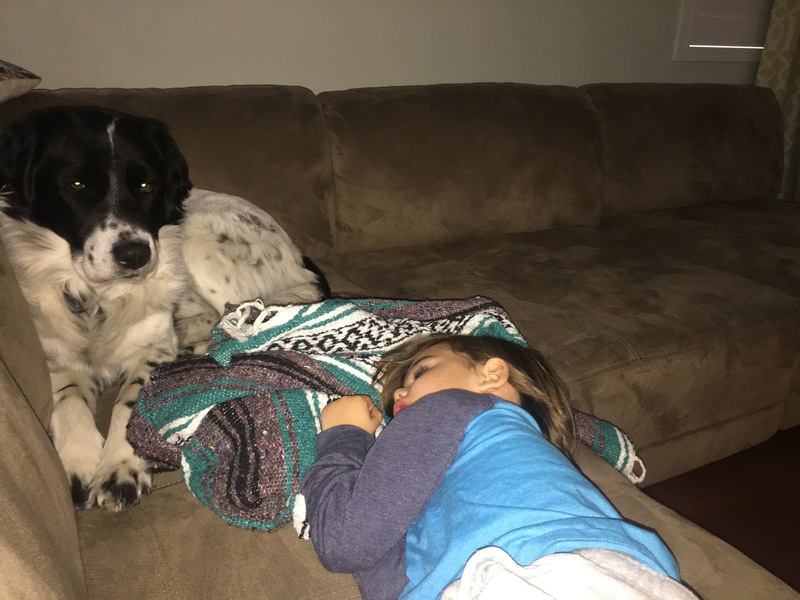 On day 3, I had been out for a bit and came home to the 3 boys out front in our large cul de sac and Moonshine was off leash, staying with them and coming when called (if needed). Moonshine was SO excited to see me and ran straight to me. I couldn’t believe he was off leash and bonded to us all after just 3 days. And our bond with him has just continued to grow this past year. 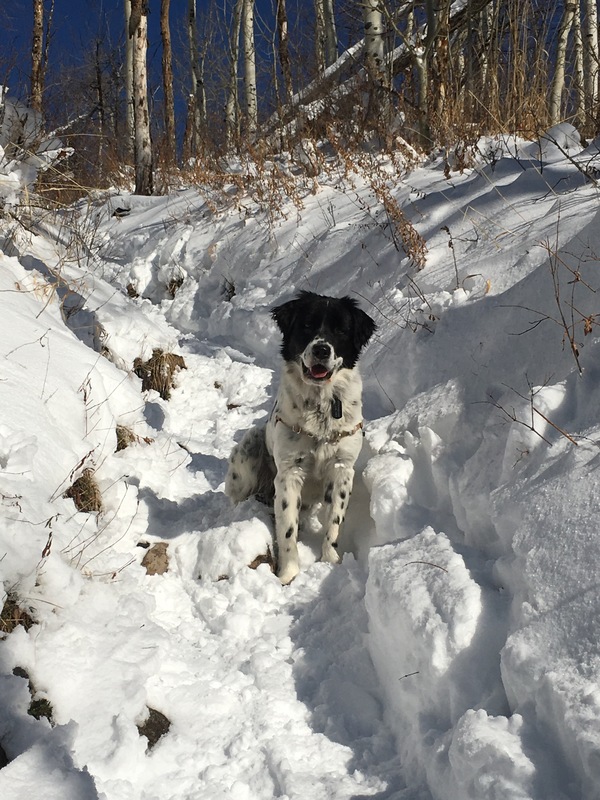 Moonshine’s first snow with his new family – he LOVED it! I love the way he looks up to me or Jerry for reassurance when he is unsure of something. I love that he loves to hike and camp as much as we do and we never have to use a leash when we’re out there. He always stays close by and if he gets a little ahead, he runs back to check on us and let us know he’s alright. I love that he waits for permission to leave the house with us, to get up in the car or to get into the water when we hike (or the streams or lake by our house). I love his deep and loud single barks to alert us when he thinks we need it. I love his dedication to Connor, his gentle and sweet nature with him and all kids and adults he meets. I love the way he comes to me at the end of the day and snuggles against me and on my lap. I love his loyalty and devotion to us all. Jerry and I have each had many dogs in our lives and a few together but we can both honestly say Moonshine is the cream of the crop, the best of the best. We really really lucked out with him. We are all so thankful he chose us when we met him. We look forward to many more years of adventures with him by our sides! 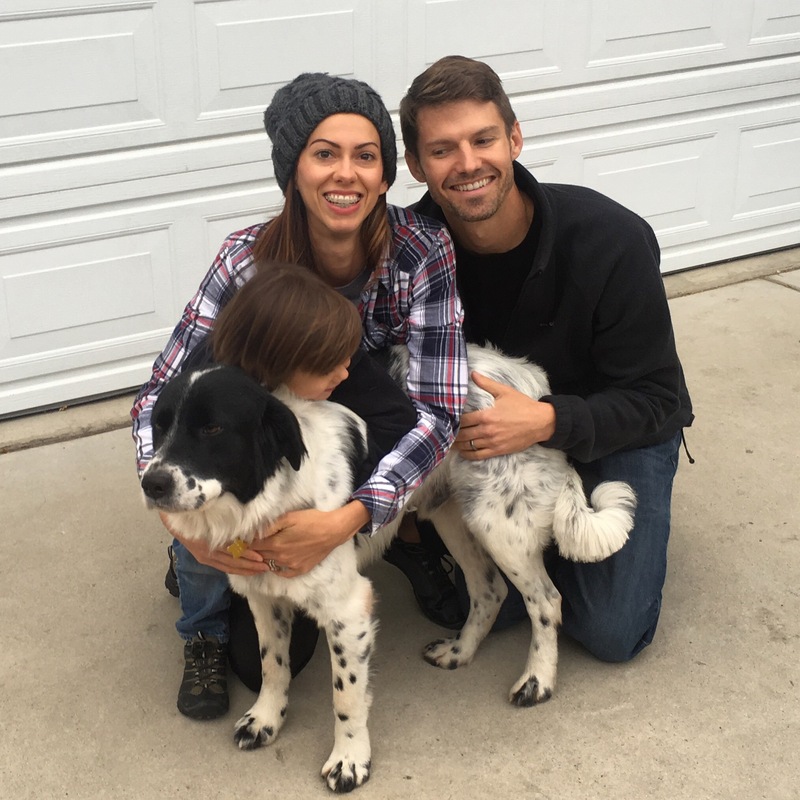 Jerry, Heather and Connor (4) along with our loyal pup, Moonshine, live outside Salt Lake City, Utah. We love the outdoors and encourage Connor’s passion to wake.explore. repeat.